I’ve been waxing nostalgic lately, and with the cookout season officially underway, I recalled how my dad used to love to fire up the grill when I was a kid. Grilling, along with the occasional pancake supper, were the only times Dad would do the cooking. 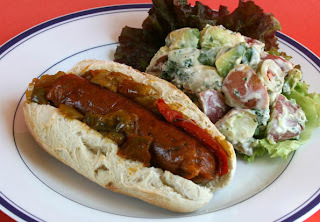 Instead of the usual hamburgers or hotdogs, however, my Italian father preferred to grill spicy sausage and peppers which were served in warm crusty rolls, often accompanied by my mother’s potato salad. Fast forward a zillion years to my vegan versions of these family favorites. The potato salad is an easy do-over, since I just needed to swap out Vegenaise for the mayo and omit the hard-cooked eggs that my mother habitually added to her potato salad (double helping of cholesterol, anyone?). At the last minute, I diced a ripe avocado that I needed to use up and added it to the salad, and I’m glad I did. The avocado was a nice counterpoint to the pimiento-stuffed green olives that are requisite in my Close to Mom’s Potato Salad (below) adapted from Vegan Planet. For the sausage, I used a recipe from one of my upcoming cookbooks (sorry, I can’t share that recipe just yet) in which I come close to the seasonings in my family’s sausage recipe. To cook the sausage, I used a variation of the steaming method I learned when I used to make seafood sausages as an omni restaurant chef — we’d shape the delicate seafood mixture into logs and wrap them in plastic wrap and aluminum foil before steaming. For the vegan sausage I just use the aluminum foil. To approximate the great Italian rolls my family used to enjoy, I defrosted some frozen pizza dough, divided it into quarters that I shaped into logs and baked for about 15 minutes. After cooling for a minute, I sliced them open, added the sausage and peppers, and served up a taste from my childhood — vegan-style. It’s definitely not a low-cal, low-carb, or low-fat meal, but, hey, at least it’s cholesterol-free and a delicious indulgence for a cookout. Adapted from Vegan Planet. I used small red-skinned potatoes and left the skin on. To this recipe, I also added a diced avocado, making it a little less close to Mom’s version! 1. Boil the potatoes in a pot of salted boiling water, until tender but still firm. Drain and allow to cool, then cut them into bite-size chunks, and place them in a large bowl. Add the celery, onion (if using), and olives and set aside. 2. In a small bowl, combine the vegan mayonnaise, soy milk mustard, vinegar, and salt and pepper to taste. Mix well and add to the potato mixture, stirring gently to combine. Sprinkle with paprika. Serve right away or cover and refrigerate until ready to serve. When I was a kid my mom never had to tell me to eat my greens. I’ve always loved them just about any way I could get them—and I still do. This year our vegetable garden will give us escarole, arugula, spinach, chard, two kinds of lettuce, and kale. That should keep us up to our necks in leafy greens until next winter. There’s a lot to love about greens. Sure, they’re super-nutritious and they taste great. But what I like best about them is their versatility. Take kale, for example. You can eat it raw in a salad or fried as chips. You can steam, boil, or sauté it. And that’s just for starters. My own kale isn’t ready to pick yet because we planted late, but the other day I bought a huge bag of curly kale at the supermarket. It wasn’t very tender, so I blanched it for a few minutes (which also helped it fit better in my refrigerator). I sauteed some of it with garlic, white beans, and brown rice. I added a handful to a soup. I even used some in a smoothie (with pineapple and bananas—yum). That left enough to serve as a side dish to accompany some barbequed seitan and roasted sweet potato sticks. When I have tender baby kale leaves, I like to serve it raw as a salad combined with diced avocado and a squeeze of lemon. 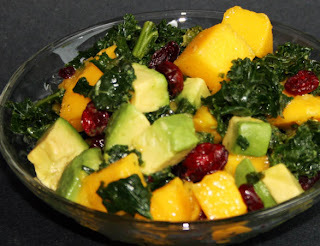 That’s how I had planned to serve this blanched kale, but at the last minute (while waiting for the sweet potatoes to finish roasting), I also added some diced mango and a few dried cranberries. The result was a kaleidoscope of color and amazing bursts of flavor. What could have been just a “side of kale” turned out to be the star of the entire meal. Sometimes when I’m too busy to cook, I think minestrone! Last week was one of those weeks when I didn’t even have time to eat, much less cook, so I was glad I had a pot of minestrone simmering on the stove. 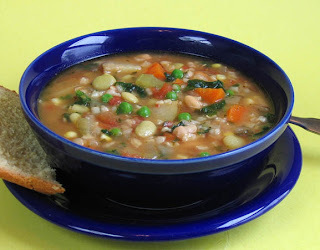 A good vegetable soup makes a quick and easy meal that can get you through a few days. The bonus is that the soup gets better with each reheat. Like any good minestrone, I include a wide variety of vegetables, typically whatever I have on hand. It’s usually a combination of the usual fresh soup-starters: onion, carrot, and celery, along with some zucchini and spinach, if I’ve got them, or some frozen veggies, if I don't. I also add beans — this time it was Great Northerns — and a can of diced tomatoes. Near the end of cooking time, I toss in some frozen green peas. For this batch, I added some brown rice to cook right in the soup, but you could also add some cooked pasta, rice, or orzo when ready to serve. A spoonful of pesto swirled in at the end adds a wonderful flavor note. This recipe is adapted from my book, Quick-Fix Vegetarian. As noted in the recipe headnote, this recipe is more of a guide than a gospel — add whatever vegetables you prefer, season it the way you like, and if you have time, it’s best to cook it a bit longer, the flavor only gets better. Heat the oil in a large pot over medium heat. Add the onion, carrot, and celery. Cover and cook until softened, 5 minutes. Stir in the garlic, then add the limas, frozen vegetables (or zucchini), tomatoes and their juices, beans, and broth. Add the basil, oregano, and salt and pepper to taste. Bring to a boil, then reduce heat to low and simmer 30 minutes to an hour. A few minutes before serving time, stir in the spinach and parsley (or pesto). Taste to adjust seasonings. Stir in the rice or pasta if using. During the last two visits to my favorite Thai restaurant, all I wanted for lunch was spring rolls and more spring rolls. A few days later, I still had a taste for more, so I made some for lunch. 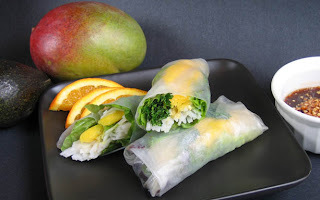 This time I filled them with red leaf lettuce, rice noodles, cilantro, mango, and avocado. Dipped in a spicy-sweet chili sauce, the flavor was sublime. But I know it’s only a matter of time before I crave them again. In fact, I’m already craving them again. 1. They’re self-contained packets making them easy to pick up and eat. 2. They get dipped in a yummy dipping sauce (always a plus). 3. They’re made with fresh, healthful ingredients. 4. They have a great combination of textures and flavors: at once crunchy, chewy, sweet, and spicy. 5. They’re like eating a wonderful salad, only fun because you can eat them with your hands. I’m totally hooked! Is anyone else as spring-roll obsessed as I am?